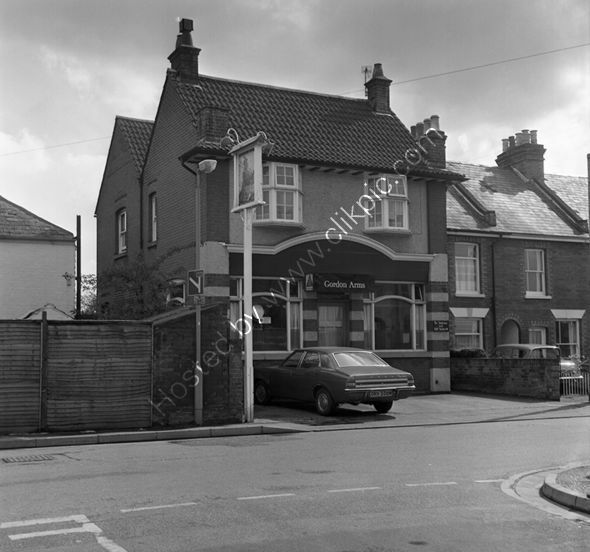 Gordon Arms, 107-109 Gordon Road, Fareham, Hants in 1973. Now closed and converted to a dwelling. Reported to have closed in 2013 and police searched for the body of a murder victim in the disused pub in 2014. The Ford Cortina Automatic is almost new and registered as ORV 336M so registered between August 1973 and July 1974. The car in the drive of the adjoining house is a Ford Anglia. There is a gap between the pub and the next property and a sign sending you down the alleyway to "Saloon and Off Sales." For commercial use of this photograph please visit www.alamy.com and search for RFFCBK but for a one off print, please see below.